Control and make every step beautiful. 1. Rimma, could you please tell me about yourself? How was your story of becoming a contortion artist? What was your biggest challenge and how you overcame it? It started from the very childhood, because I always was a very active child. And my parents could see my energy and I spent it on many things, I always felt passion for arts. I loved to do everything with arts, dancing, some acrobatic things. So I had so much energy and that brought me to the circus school. I started going to the circus school in our city. Besides this I also did some other things, I played violin and piano. So I also liked music, because my parents are musicians. And I did everything that has to do with arts. When I was to decide what I want to do for my life like a job, I was thinking that it will be nice to unite all this things into one – like acrobatic things, with energy and passion for music, and make more art. That is how I went to the Circus Academy and I wanted to do something beautiful not only with power and create something nice on stage. 2. How was your creative process of developing your own style as an artist? For the moment and for future I never belong to that kind of people who have only one style, because I always love to change, to create, to work with creative people and for me it’s more interesting to work with creative things and do something new, change music, change style, change numbers, because I think it´s a little bit boring to do the same sequence. I have my handstands too and the main things that I have to know about handstands. But I love to try something new and to work with different directions. I´m open to the creative things. So I don´t have any specific style. I do everything what people want, because we have so many different shows and people who want us to present at the show, they have special ideas and directions for the show. And we must belong to this show and we can’t do only our own thing, we must do it together with the show. They want a new music very often and I’m open to this. So I like to do something new to. 3. How does your usual day look like? How long and how often do you train and stretch? How much time do you do strength and balance training and how much stretching? How long do you warm-up and stretch before the performance? Usually every day I do at least a few hours of handstand for myself. But it also depends on which period of the year it is. Because in summer one hour is enough to keep my body in a very good shape. So for summer it’s at least one hour a day. But for winter it´s a few hours a day that I would train. And before performances I need around 2 hours warm-up because one hour is for stretching and one hour to prepare my body. We work every day, one or two or sometimes more shows. Sometimes it´s hard when it´s very cold. It´s hard to start and to bring our body to that condition, but we are professional. So we do it and train anyway. 4. Do you have some special eating habits? Are you vegetarian or vegan? Actually I’m not vegetarian, but I try to eat less meat and not so often, because it´s very heavy for me before the shows. But I eat everything that I need and everything that I feel that my body needs. But my main food is more healthy food. I try to drink much water and eat healthy, but if I feel that I want something bad, I will eat it anyway, but much more less than usual normal food. So I can´t live without coffee and chocolate. But it’s not a special diet, I just eat what my body wants. 5. How do you prepare for the show? The whole preparation with style, hair, warm-up takes around 3-4 hours before the show. 2 Hours are warm-up and 1 -1:30 hours is hair and makeup. And after the performance I also finish with my body and do some exercises for relaxing, I bring my muscles to good state. And I never go immediately home after the performance. So at least for half an hour I finish with my body. We do many strong and flexible moves and after that I have to do stretching for relaxation. Because I won´t feel comfortable the next few hours or even days if I don´t finish with my body how I usually do it. 6. So you usually don’t have to choose the music. When you can choose your music how is your process of choice? It´s also depends on which kind of project it is. Because if I want to make my arms number, with my music if I choose a person who will make me a number, we make it together. But now people mostly invite me to work at the projects that they already made. And they have their own music. Like now we are working with the live music and the live band at the Variety Wintergarten. We have a direction. It´s Schlager show and they put together the most popular songs for this show. All the artists perform on stage with the live band and with the live music to these popular songs. Nobody work with their own music. So now usually and in the shows we work like this. We do our things with music under different directions. But for some gala we can present our own numbers and with music that we like and it’s our choice with which person we work to make the number. If we want something special we can show it at some festivals or gala. 7. You traveled a lot and worked on the ship. How was that time? I was travelling a lot because I worked with contracts with cruises companies. I started to work with Aida Company. It´s cruises company. I traveled a lot in Europe and Island. It was the best ever experience for me and for my job. Yes we lived on the ship all the time and performed. Sometimes is was not very safe, because the ship was moving and for the hand-balancer it´s not the easiest place to perform. But so many artists work there. It was a nice time and a very big experience in my life. I was working with so many creative people and I´m connected with these people till now and some of them are also from Germany. It was a big experience. At the ship we have few shows for the week, because they have shows for every day and it´s more dancers and singers shows. They had only 2 shows with artists One show was a variety with 3 artists – only circus show. And the second show is the main show for the whole cruise in which all the artists, singers and dancers take part. So we work a few times with this variety show and a few times a week with this main show. 8. You travel a lot performing. Could you please share some funny episode during your performances? I don’t think that I had something very special and very funny. I can say that working in every show, in each new artistic group is a lot of fun, because everybody is very different and artful. We always have fun with each other at the backstage. 9. How do you create your contortion transitions? Could you give some tips for interesting transitions? Of course it’s always good if your body has more possibilities, if you are more flexible, it´s easier to do it. But anyway it’s always hard work. You have to concentrate, you shouldn´t do a lot, but rather be very clear every step. Because contortion and hand balance is always concentration and it´s not more power, it´s more right direction of your soles. I think everybody can get results. I had experience and I saw how some guys who came to our Circus Academy to train with our teachers got good results for such a short time. They didn’t do so much, but in some years I saw them in Facebook on pictures and they did so many strong things from hand balance, that not so many of our guys from our circus school group did. I think if you want and if you feel that you want to learn it, you will do it anyway. You just need to try and see what you really want to do. Only passion for your job will bring you to good results. If you do it without any wish, you will not get it good enough. 10. What precaution tips can you give for contortion students or aerialists who are interested in contortion? Did you ever have injury and how have you cured it? I had accident once in my life. It was one of two years ago, I broke my finger on my arm. Of course I was nervous if I could do my job and it was the moment when I was thinking that it’s very important for me to save my body and be very careful with my body, because it´s my job. It was only once time in my life. And even having broken my finger, I trained and did everything I could do with my body: some exercises for legs, for stomach, for everything. In one and a half months I could continue my work. I just wish everybody to be very careful with their body who is doing this kind of job. Do you also use back warmers? You mean some special things for back. No, I never use them. I never used it, so for the moment also not. 11. 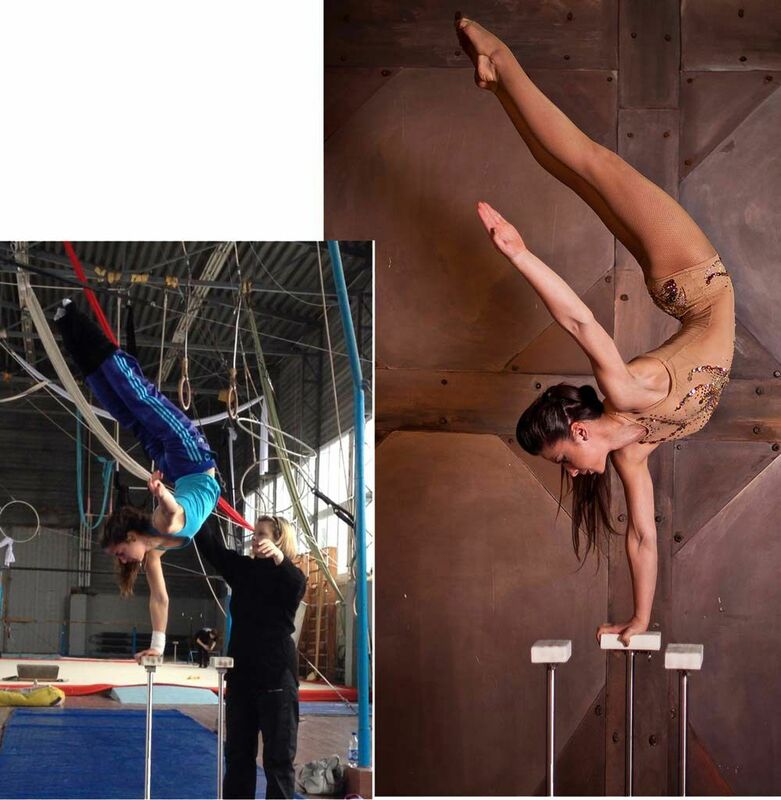 What are the best exercises to get strong hands for handstands and for aerialists? I think that the most important thing is f you want to do handstands, you should start and do handstands. You do handstand on 2 hands, never forget to breath. Breathing is very important. Because otherwise it´s not very healthy and it´s a wrong way to do it. So breathing is important and you should keep your belly inside. You should hold your belly and do handstand. You can stay close to the wall, but try to keep your points up as high as possible. It´s a little bit difficult to explain in English, because I don´t teach people in English and it´s a kind or private lessons, and it´s better to show and do it with people in person. 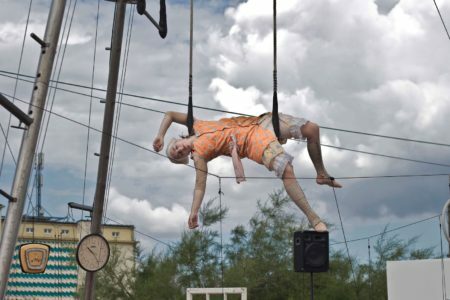 For aerialists it´s very good to do the climbing with silks. You can do it just in an usual way or even better you can held your legs open and go up and down using just the hands. It´s one of the best exercises because you work your arms,, you belly and everything. 12. 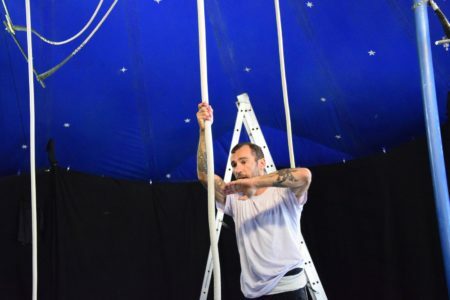 How does circus scene differ in countries where you performed? During trips on the ship we were working only with our circus group and it was only a few circus people on the ship. We could travel, as our passengers and go outside. We went out only for one day. So it wasn’t really a big possibility to watch another show and be far from the ship. Sometimes we met our people from the Ukraine who were working on different ships as the ships stood in the same play and we could met each other sometimes. It was fun and some of the best performances. We could meet our people in Paris, England or somewhere, because when 2 ships come together in one port we just went out and could see our friends from the circus school. And it was a very big surprise. And it happened so many times. 13. What is the most important in an artist and in a performance in your opinion? The most important is just feel and love what you do, because if you love what you do on stage, people will love it too. If you do it without any passion, it doesn’t matter which kind of tricks you show, however strong or flexible, people will be bored if you won´t show your the whole beautiful performance. That´s why you should control every step, make beautiful every step. And also sometimes we are tired because we have work every day, several shows and also if we make mistakes, we must try to make every step beautiful. And they even can´t see these mistakes if you try your best. So the most important – do it with a passion. 14. Where one can book you for a show? You can find me everywhere: on Instagram, Facebook, YouTube, Google +.